Back in 2012, Elizabeth Graeber and I decided to collaborate on something. It took us a while to figure out what-- a calendar? a zine? 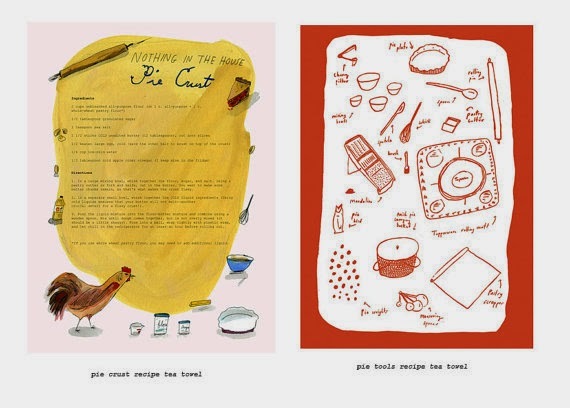 recipe cards?-- until we settled on an illustrated pie cookbook featuring a recipe for every month. Since putting out (and selling out of!) Pie. A Hand Drawn Almanac we've collaborated in many other ways, but among the original ideas in our first brainstorming session were hand drawn tea towels. This year, we're circling back to that and have made 2 two towels, illustrated by Elizabeth, in two different designs. One, in multi-color is of the Nothing in the House pie crust recipe, and the other, in a red-orange and white, illuminates different pie tools, similar to the end pages of the pie almanac. Both tea towels are printed on an off-white linen-cotton canvas, measure approximately 19'' X 26.5,'' and are made in the U.S. and sewn by us. They're now available, made-to-order via Elizabeth's Etsy shop. While we *hope* to have them to you in time for the holidays, we can't guarantee it, as towels are printed and made-to-order. We'll try our darndest, though! Labels: elizabeth graeber, gifts, hand drawn, illustration, kitchen, pie almanac, pie art, PIE. A Hand Drawn Almanac, tea towels, Washington D.C.